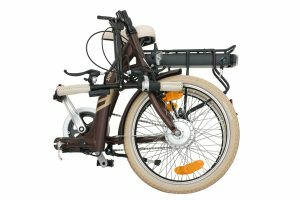 Our electric bike storage bags are specially designed to fit the Batribike folding electric bikes. It will fit the current SIGMA model as well as older generation DASH, BREEZE and QUARTZ bikes. The bike bags are made from hardwearing fabric that has been PU coated on the inside. The PU coating allows customers to keep their storage space clean when transporting their bikes in more inclement conditions. This is particularly important for our customers with motorhomes or caravans where the bikes may be transported in the living area. A heavy duty double ended zip runs round three sides of the bag making it very easy to put the folded bike into the bag. Our customers tell us there are two ways of putting the bike in the bag. Lay the bag down, fold the flap to the side, lay the bike on the bag, fold back the flap and zip round. Fold both sides down, stand the bike in the centre of the bag, fold both sides up and zip round. 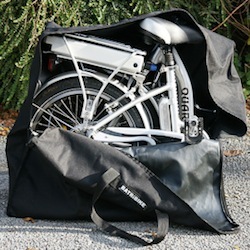 Purchase your Batribike folding electric bike storage bag from your local Batribike dealer. Life On Wheels is the Batribike electric bike stockist for Holywell, Flintshire, Wales. The enthusiastic team here are Cytech qualified.